From the archives: IB World magazine regularly highlights graduates of the IB Diploma Programme. Maya Krishnan, Richard Montgomery High School, Maryland, USA, was featured in March 2015. “What is art?” That is the perplexing and abstract question Maya Krishnan was asked during a class field trip to the Museum of Modern Art (MoMA) in New York City. But far from being daunted by the task, Maya calls it one of her fondest moments during her time at Richard Montgomery High School, Maryland, USA, where she studied the IB Diploma Programme. Maya’s ability to think critically has certainly paid off. She is currently studying philosophy with computer science and classics at Stanford University, California, USA, and has been awarded the Rhodes Scholarship to further her studies at Oxford University, UK. It is the oldest international graduate scholarship and is granted to just 83 students each year. “I originally applied for the Rhodes Scholarship because Oxford is a major centre for philosophy,” explains Maya. “I feel so excited and honoured, and can’t wait to start classes this October. “I’m planning to get a Master’s degree in computer science in my first year, as I’m interested in the philosophical implications of developments in computing,” she adds. 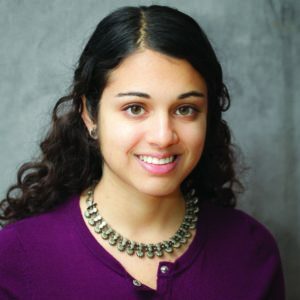 The IB influenced Maya Krishnan to successfully connect two unlikely subjects. “It will give me the technical foundation necessary for that kind of work. After that, I’m planning on getting a Master’s degree in either philosophy or philosophical theology.” This may seem like an unusual combination of subjects and it’s Maya’s experience with the IB that helped her identify the link between the two. “The IB Diploma Programme taught me how to seek out the connections between different subjects I studied,” she says. In true IB fashion, Maya hopes to reflect on what she learns during her computer science degree through philosophy coursework. Maya’s initial interest in philosophy was sparked by her IB history and philosophy teacher, Robert Thomas, who was a “huge influence”. “It began when I read Plato’s The Republic as part of his class,” she says. “Every week we would have ‘Plato Friday’ where we moved our desks in a circle, read the text out loud, and debated it line by line.” Maya’s achievements to date are impressive. She has created and maintains an online database, called the ‘POLIS’ project. This interactive searchable map correlates two separate datasets about ancient people and places. “There’s a lot of data available about people and the locations they were associated with in ancient Greece and Rome, but it’s not in a format that is readily accessible,” explains Maya. To relax, Maya likes to run, play the oboe and listen to classical music, particularly Bach and Rimsky-Korsakov. But she still makes time for charitable causes. She has worked as a technology scientist for Horton’s Kids, an educational charity that helps some of the poorest children in Washington, USA. “Philosophy and computer science can be very abstract, so it’s nice to do something very concrete that I can see makes a difference,” she says. “When I build a new database for an organization like this, I can see for myself how it affects their daily operations. I get the feeling of being immediately connected to the community.” And how does she get it all done? That’s something Maya attributes to her IB Diploma Programme days too. This story originally appeared in the March 2015 issue of IB World magazine. Are you an IB graduate? Join the IB Alumni Network by visiting www.ibo.org/alumni.